It was towards the end of January this year that I sat down and watched the science fiction film, Under The Skin. The film is told through alien eyes as Scarlett Johansson, the alien of the piece, hunts men in Glasgow. This set me thinking explicitly about what it is to be human and what an alien from another world might see. At the same time I had been researching the history of the Nazi death camps before and during World War 2, a prime example of the phrase "man's inhumanity to man". But what is "humanity" in that sense? What does it mean to be human? 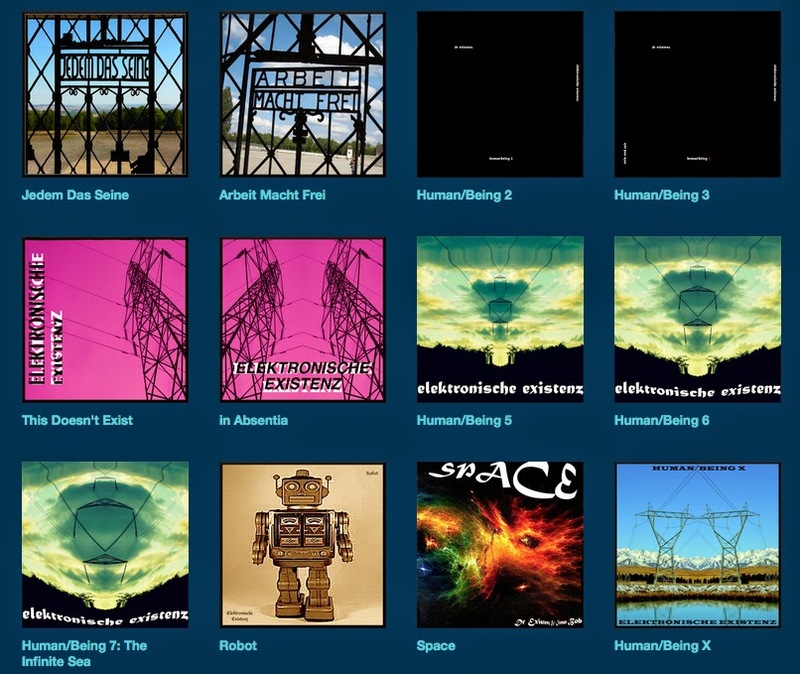 And so my "Human/Being" musical project was born. As we now approach mid-April my project has grown to 12 albums and 10 parts (parts 1 and 4 were double albums). It now fully mirrors in scope, if not storyline, my first musical project, Elektronische Existenz. Of course, as the names might suggest, these are really the same or close relatives as projects. I see it as my task to write music that gives meaning to life itself. Primarily, of course, this is my own. But, in a wider sense, this is adding my voice to a greater conversation about what life is for any of us. I'm aware this might sound a bit pretentious. But I see this as an art project and the music I have made here is intended to be an aid to thought. Elektronische Existenz told the personal story of a character I called "The Wanderer". It was my story. Here with Human/Being I muse on wider, more general matters starting with that musing on what we are and what "humanity" is. Throughout the project I have tried to focus on particular areas. These were meditated upon pretty much as they occurred to me. The music I make is overtly philosophical in origin if not always in tone. And this is the most philosophical music I have ever made. Human/Being 2 came at the time when Tangerine Dream founder, Edgar Froese, died and so it starts with a tribute piece for him, a massive influence upon exactly the kind of music I was seeking to make here. It continued on with meditation on sleep, the fear of madness and the human condition. Human/Being 3 focused on time and our nature as time-bound and time-determined beings, always conscious of the ticking of the clock. I was trying to use the music as an aid for those who might actually sit back and allow what I had made to assist them in thinking. The fourth part of the project was a double album (the pink covers) and was really about the concept of human meaning at all. All meaning is inherently fictional. We literally make things up. In the notes to these albums I mused that "Whatever I say this is, it isn't that. Whatever you think this is, it isn't that. For this isn't at all. It is merely a process of becoming that never ends. It is a game with sounds, but a game where you decide the rules or even if there are any at all." I also invited listeners to "find meaning in the spaces between sounds". It was game-playing but it was with serious intent. What is human meaning? Why do things mean something to us or not? Again, the music was there to assist with thinking about this. This, I thought, was - is - our human condition. I had intended to stop at part 7. (My process is a constant one of stopping and then being re-animated by some new thought or stimulus.) But then I watched the film Chappie about a robot given artificial intelligence and I was back asking myself if a robot could ever be human. That, of course, leads you to ask what being human is in order to in any way get a grip on the first question. (My current thinking is that the robot couldn't be human but maybe it could be a being of its own.) And so I wrote the album "Robot" which became part 8 of the project. Next came "Space", unique in this project for being a collaboration on the musical side with my Twitter friend, Iceman Bob. All the songs on this album were worked on by us together. Space, of course, I see as the big, all-consuming context for everything humans do. We are, as Carl Sagan said, all "star stuff" (the title of one of the songs on Space). You don't get much more profound than this thought, I think. Space is the reason we exist. We all came from it and we are all surely going back to it. It creates and destroys, ever changing. You want profundity? There is your profundity. That leaves us, finally, with part 10, Human/Being X. Here I concentrated, anticipating another ending, on the concept of "the end" as an idea. "All good things must come to an end" is a saying we humans have. But, of course, it is truer to say simply that all things end. As George Harrison titled a triple album, All Things Must Pass. I titled the tracks accordingly around fields of study that have within them endings. The human race will end, the universe will end (or die) and this is a very part of having any existence at all itself. The riddle is that within all life there is always death. A fitting place to finish? So that was the subject matter. But how to achieve expressing these ideas musically? The answer was "German music". This year I have been greatly influenced by two, related sources of German music of the 1970s, that music known as The Berlin School and that music known as Kosmische (or Krautrock). You will hear the influences of both styles throughout all 10 parts of the project, although in some more strongly than others. Some may even qualify as bona fide examples of the forms. I'm far to modest to make any such claim though. Listeners may feel free to be the judge of that. As I said above, I have aimed with this project to produce "thinking music". This is music that both comes from explicit philosophical thought and that leads to, or aids with, it. The Kosmische and Berlin School music that I have soaked myself in in the first few months of this year were natural and very potent forms of music to use in achieving this. Both are free-form and without boundary giving the necessary space and freedom to think. The fact that my music is made using synthesis was also a help in that you are not stuck with stock sounds but can make sounds as you will or go where the synthesis leads. That's another reason why the pieces in this project are purposefully long. The idea was not to rush anything.What I have made here are long form pieces that are about thinking, thinking about what it is to be human and what it is to be alive, to have being. It is "space music" in a very real and multivalent sense. So what I think I have made here is music for the thinking person. Its not frivolous or trite. Its serious. Its art. Its philosophy. Its over 13 hours long. I am me. What else could it be? You can hear the albums in this project at my bandcamp. Economically Unproductive People Don't Matter!